Learn the Shim Sham, plus useful jazz steps for swing dancing, all in one accelerated 60-minute session! 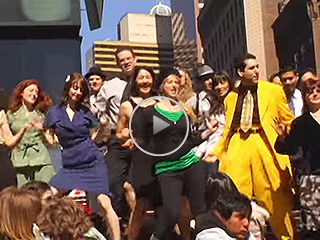 The Shim Sham is a swing line-dance & mixer that goes back to the early days of swing, jazz & tap dance. 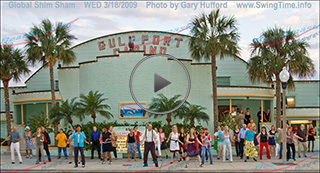 It has become a tradition at swing dances across the world, and is a fun & energetic part of just about every swing dance in the Tampa Bay area! 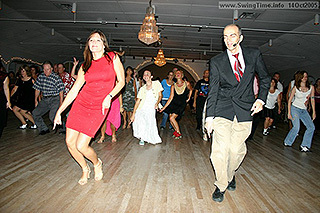 Swing Time led the Tampa Bay Shim Sham for Frankie 95, Frankie Manning's 95th birthday celebration, teaching then dancing the Shim Sham outside and inside the Gulfport Casino Ballroom (see rightmost video above). Our video was included in the Global Shim Sham compilation (see leftmost video above) and was recently featured in a CBS Sunday Morning national news story! Our Shim Sham classes are designed for everyone, from novices who've never danced before, to experienced dancers who've been dancing several years. There are no prerequisites, so anyone can drop in and take them. All classes stand on their own; you need not take one to take any of the others; but the more you take, the better your dancing will be! No partner is needed.